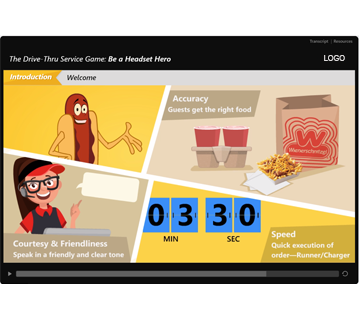 The client is an American fast food chain that specializes in hot dogs with approximately 350+ outlets across America. Employee turnover in the food industry is very high. Training costs are therefore very high. The client had some kind of video-based training already in place but it was not delivering the expected results. So, they were looking for something more engaging, motivating, and effective to train their drive-thru workforce. 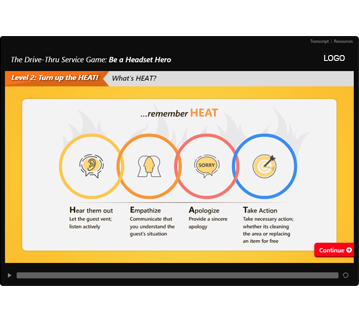 They wanted to implement a gamified learning experience to achieve their objective. They had even zeroed down on the content to be used from their service content manual. At a drive-thru window, pressure can run high and even the smallest mistakes can prove catastrophic, backing up lines and spelling disaster for both customers and the restaurant. The client therefore wanted to train its workforce using similar-to-life experiences. 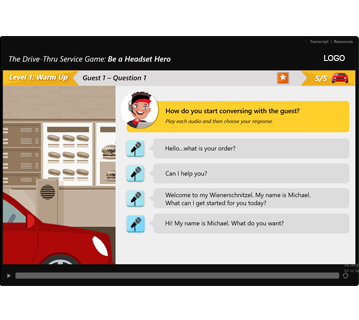 Keeping the subject, requirement, and the audience in mind, Harbinger proposed to use a scenario-based gamified approach which would expose the learner to real-life experiences at a drive-thru window. 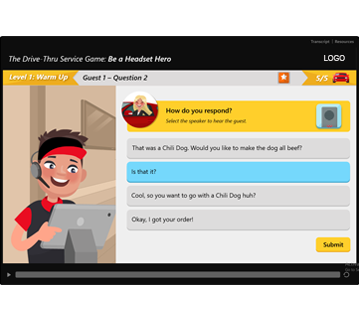 The game that was finally designed uses a very simple, conversational narration style, to simulate a real-time customer experience. An environment similar to the restaurant’s drive-thru window and customer car queues is emulated graphically based on the photographs shared by the client. The game has 2 levels. 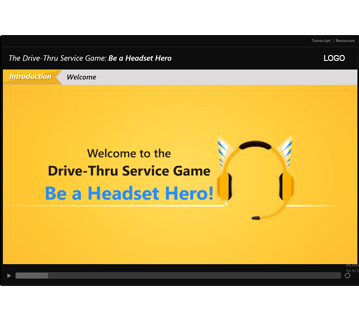 Level 1 of the game has two parts: A screen giving a brief overview of the drive-thru service process and a Practice section comprising interactive scenarios that provide learners with the opportunity to apply learning in a realistic context. 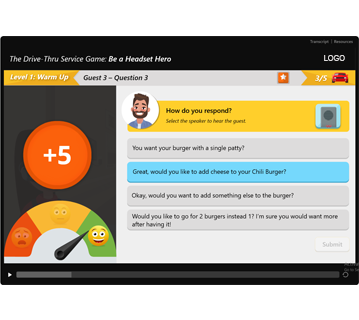 Level 2, a Practice only level, is a more complex level, where the learner has to again complete taking the order of minimum 3 guests with a maximum of 5 guests at the drive-thru counter. Each guest is required to be served in a total experience time of 3 minutes 30 seconds. 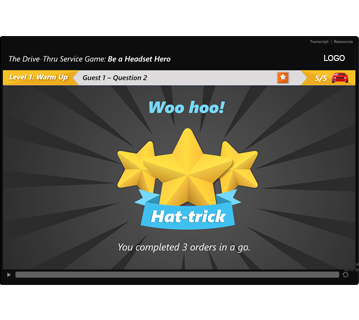 The learner can achieve badges such as ‘Time champ’, ‘Hat Trick’ and ‘Perfection’ if one, three, or five customers are served in time and become a ‘Head Set Hero’. The run against time along with a WOW factor for extra scoring and ’Runner Charger’ activation button takes the gaming experience to another level. 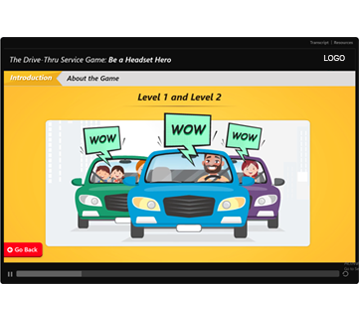 This gamified training helped train a large audience in an engaging and fun manner while driving home defined learning objectives. The trainers feel that the new module is helping new team members learn more quickly than the previous program. Team members have shared their feedback mentioning that the module is fun, simple, engaging, and motivating to achieve perfection. The improved training has helped team members execute the brand standards at a higher level. Do you have a similar case to discuss? Let’s talk!